If Glenn Roeder ever needs reminding about his footballing roots, he need only walk across West Ham's training ground, lean on the fence and look across to the adjoining field. It was there, on Westlands Playing Fields, that it all began for Roeder more than three decades ago, playing for Havering Schools representative teams on Saturday mornings, watched by a clutch of proud parents and at least one, reasonably young, local sports reporter. Roeder's footballing life has since gone full circle and he is back across the fence at Chadwell Heath as a West Ham coach, looking forward to Saturday's Premiership clash against Newcastle, one of his former clubs. 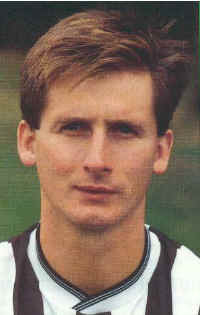 Roeder spent most of his five and a half years at St James' Park as captain. He was also a player at Queens Park Rangers, Watford and Leyton Orient, player/manager at Gillingham and a manager back at Vicarage Road. During his career he played alongside some of the most talented and tempestuous stars in English football, free spirits such as Paul Gascoigne, Stan Bowles, Tony Currie and Kevin Keegan. He was also part of the England set-up during the Glenn Hoddle era, eventually leaving in the wake of Hoddle's acrimonious departure, since which he has been part of West Ham's coaching staff. "I can't think of anything else I'd rather be doing," he says. "I was never considered good enough to play for this club as a youngster but to be here now, working with quality players, is a real pleasure. "Two of my brothers-in-law have been season-ticket holders for years over in the Chicken Run - I should say, East Stand - and they will be in their usual seats for the Newcastle match. "The job satisfaction for me at West Ham could only be bettered if we had a few more points on the board. Obviously being in the bottom three makes things a little uneasy but Harry Redknapp will get it right." Roeder joined Newcastle in December 1982, "mostly for the opportunity to be in the same team as Kevin Keegan", he says. "I thought I would only be there six months and want to come home but I stayed more than five years." It was during that time, as Newcastle skipper, that he became a good friend and guru of a young, insecure Gascoigne. "I met Paul on my first day there," he recalls. "Keegan had driven me up to Newcastle the previous night but after my first training session, he was quick to leave with Terry McDermott, probably for an afternoon's racing. "I was left to my own devices at the training ground and it wasn't long before I noticed one of the apprentices organising jobs for the others, but not for himself. "That was Paul. I ended up travelling back to the hotel on the bus with him and the other apprentices and that was the start of our friendship. We were opposites in personality really. He was an extrovert while I was quieter, more content with my own company, but we gelled. "One weekend, after we had played in London, he stayed with me at the house I kept in Essex. On the Sunday morning I took him for a drive and ended up parked outside Trevor Brooking's house. "I told him he could own a house like that if only he realised what he could do and grabbed the opportunities which would come his way. "'I'll never have a house like that,' he said. Little did he know what was in front of him. He could have bought the whole road since, with all the money he has earned. "I still try to keep in touch with him. It's not easy because he changes his number constantly but you can't blame him. He has been through the mincer in his career. Some of his problems have been self-inflicted but people haven't always given him the right advice." Roeder describes Gascoigne as a "flawed genius", one of several which he has encountered over the years. "There was Laurie Cunningham at Leyton Orient - a real eccentric and sadly no longer with us and then there was Stan Bowles and Tony Currie at QPR. "Stan was up there with the best I have ever seen. As a fellow, everyone liked him but he had a big problem with gambling. There were two schools of thought - he was either the most fearless of punters or the most stupid. "When Stan departed for Nottingham Forest, Tony Currie arrived soon after from Leeds. He could play off both feet. He weighed about 14 stone and he had no pace but he could surge with that ball, across the halfway line and deep into enemy territory. I don't think Tony would mind me saying he had a few personal problems, though." Eventually, Roeder came back south, joining Watford, first as a player and then, after nine successful months as Gillingham's player/manager, he returned to take charge at Vicarage Road. "I made a net profit of £5 million on transfers in my time there and the chairman, Jack Petchey, used the money to build two new stands," he recalls. "Now, I never saw a grandstand head a ball in at the far post and you can't keep on selling your best play-ers without eventually going down the drain." The next stop for Roeder was England - part of Hoddle's team. "I will always be grateful for that chance," he says. "Glenn was a young, first-class coach and he's only going to get better. In the end he was punished because of his beliefs but those opinions were honestly held and, in the end, helped him through the trauma he faced." "People accuse Glenn of being arrogant, aloof, stuck-up but there is a fine dividing line between arrogance and shyness. When I first joined the England set-up there was caution while he assessed you but once he knew there was mutual trust, you were in." Hoddle's departure from the international scene also signalled the end for Roeder but he was soon back in gainful employment, with West Ham. "I owe Harry Redknapp an immense debt and no one should underestimate what he's done here, wheeling and dealing, guiding the first team to the top half of the table for the last three years," he said. "I hope he stays here for the next 10 years but if not, the club should make him a director when he packs up. "The West Ham and Newcastle fans are very alike really. Most of them come from the east end of their respective cities and money doesn't come easy to them - they're grafters. "I have a lot of affection for both clubs but West Ham are close to my heart now. There are a lot of decent people here and they deserve to have success."